« WORK SHOULD NOT BE A CURSE! I went to a rodeo the other night and was reminded of the amazing power of bulls. At the rodeo, I saw a 2,000 lb animal repeatedly leap about four feet into the air with a 170 lb man on its back while spinning until the rider was flung from its back like a rag doll. That is power. It is enough power to dissuade me from any inclination of crawling onto their backs and going for a ride. I have always been apprehensive around bulls. Growing up on a dairy, I had several jobs that required me to get into a corral with a bull. I don’t know what it is but Holstein bulls seem to be more ornery than other breeds and we had several ornery bulls. If they got too mean, my dad would get rid of them but too mean was always more subjective than I thought it should be. I remember bedding down the animals during the winter. We would get all bundled up in our insulated coveralls, boots, and gloves, mount-up on the tractor, and pull a trailer full of straw into the corral. My dad and I would lug straw bales over the frozen and pocked surface of the corral, spreading the straw out to give the cows some protection from the temperature and slop. The corral was an obstacle course of tripping hazards from iced, craters where animals had lain to frozen mounds of manure that had become heaped by mysterious forces. Add to this pleasant landscape, the circus act of juggling an eighty pound bale of straw between walking, jostling knees while suspending it in the air from bailing twine stretched tight by a precarious backwards lean. There were plenty of reasons to keep your eyes on the ground so that you would not take a tumble and find yourself immersed in all that animal goodness. Unfortunately, the necessity of watching your step had to be shared with an eye toward the most aggressive resident of the corral. While we spread the straw, the bull would circle our little perimeter. He would paw the ground, head down and steam rolling from his nostrils. He did not like us in his corral and his low, bray was a continual challenge to a fight. My eyes were constantly darting from the ground to the bull and back to the ground. I worked hard to keep as many cows, equipment, straw bales, and whatever else that was available between me and that ornery old bull. It was a dance that I did not enjoy. It was a dance that haunted my dreams. One of my youthful reoccurring nightmares was of running from that bull. I remember waking up exhausted from spending a dream filled night of jumping over fences, diving through stanchions, and sprinting across a corral while a bull was bearing done on me in a full-on charge. I have never thought that playing with bulls or ignoring them were good ideas. It seems to me that there are many people who treat sin like a bull to play with. They have a bull rider’s mentality when it comes to sin. They don’t respect the power of the flesh enough to stay away from it. They think that they can mess around with sin for their eight seconds of delight and walk away unscathed. I find bull-riding the most unnatural of events at a rodeo. All bull riders eventually get hurt. I watched two riders limp away from their ride attempts just from our night at the rodeo. Bull-riding is a very dangerous business. In a rodeo, the bull always wins. 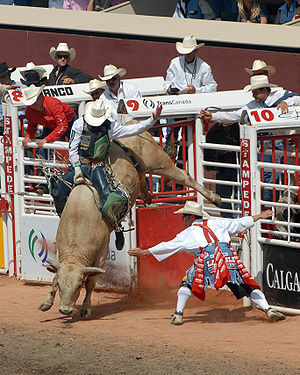 The rider may last for eight seconds but he is still flung to the ground and has to run out of the corral as the bull rampages. In the same way, playing around with sin is a dangerous proposition. Many of us allow the lingering attitudes of resentment, discontentment, gossip, sensuality, lust, crassness, etc. in our lives and think that nothing bad will transpire; as if we can manage spiritual forces of evil. When I have done that, I am attempting to ride the bull of my sinful flesh. It has never gone well for me. Sin cannot be managed. There are forces behind it. There are always consequences to sin. Some consequences may go unnoticed but the sweetness of my relationship with God has always affected when I have sought my delight apart from Christ. No one gets away unscathed. 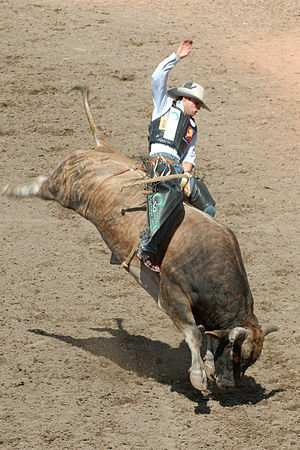 Eventually, someone is going to get hurt and in the meantime your life turns into a spiritual rodeo. The eight seconds of delight has never been worth it. However, I think that the greatest danger to most of mankind is indifference toward God. I have never thought that ignoring a bull was a good idea. It is an even worse idea to ignore God because an indifference to God is an equal indifference to the present darkness of this world. Being indifferent to powers and principalities of this world is like taking an afternoon stroll through a corral of angry, ornery bulls. We live in a world that is in rebellion. It is a world that opposes our God and us by extension. Why would we walk around indifferent to it all? Our enemy is not indifferent to a Child of God. God is not indifferent to us. Why would we be indifferent to all that is occurring in the heavenly places? Living our life in a manner that is indifferent to our advocate and protector is sheer folly. Just consider the attitude that allows us to go days without thinking about our savior; foolishness. God actively protects those who are His. God is much more than our bull-fighter but He does that very well. Christ has put Himself between us and our enemy. We should be doing all that we can to keep it that way. We should be living our lives with an eye toward the path before us but also be aware of the most aggressive resident of this world. That means following Christ with all of our heart and stop the rodeo of sinful disobedience. PRAYER: Lord, forgive me for playing around with the evil of this world. Forgive me for not taking the spiritual forces of evil seriously. Thank you for keeping me safe. Thank you for keeping our enemy away. Help me to follow you. I don’t want my life to be a rodeo of sin. I want to be more and more like you. Please continue to transform my heart and help me to see this world for what it is. I pray this in the precious name of your Son, Jesus Christ. Amen. Interesting information about bulls – and an excellent parallel to sin. For as big a chicken as I am, it amazes me that I’m willing to hop on the back of something as dangerous as sin to take it out for a “test drive.” I hope I get smarter soon! What a great reminder … and word-picture! Great article, I loved how you compared sin to the bull. 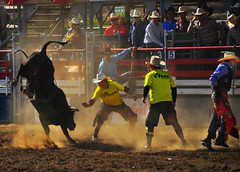 My husband and I have been to rodeo’s and we have seen so many people get really hurt. It was a great comparison. I know we are all tempted to sin and that is why I so appreciate that you always close in prayer. It always gives me a moment to pause and check myself than pray. Thanks so much for writing such a great article take care God Bless.